Electricity in NH - Did restructuring cause higher prices in New England? With more snow coming and the faint hum of the oil burner in the background, it seems like a good time for a follow-up in my electricity restructuring series. Lately, there's been a growing concern that restructuring is not working and perhaps we should re-evaluate our current "simulated market competition" approach to electricity markets. In Connecticut, some state officials want to return to the old regulated monopoly model. The justification is that electric rates in Connecticut are higher than nearly anywhere else in the country and they say that's proof that restructuring has failed. These officials point out that the lowest electricity prices are often found in states that still use the regulated monopoly model for electricity generation. In light of these assertions, I'm reminded of a favorite phrase of economists, scientists, and statisticians - Correlation does not imply causation. In other words, when two things are related, you can't just assume that one caused the other. Just because New England has high electricity rates and has restructured their electricity markets doesn't mean that restructuring caused the high rates. In fact, in Connecticut, and in New England, electricity rates have long been higher than average rates in the rest of the country. Generally, the states where electricity restructuring took hold were the states with the highest rates to begin with. That makes sense since we New Englanders have a pretty strong "if it ain't broke, don't fix it" sensibility. If electricity rates in New England weren't broken, my guess is we'd have left well-enough alone. It turns out that the main explanation for higher electricity rates in New England is that for lots of reasons, we decided to generate our power with more expensive fuels like nuclear, natural gas, and oil and we don't use as much cheap coal as other regions. In the US overall, inexpensive coal is used to generate almost half of all electricity, while in New England, it's used to produce only 12%. Nuclear, gas, and oil together produce almost 70% of electricity in New England, but only 40% nationally. Our focus on fuels such as nuclear and natural gas keeps our air cleaner, and may be necessary due to our region's resources, but it comes with a cost. Connecticut legislators also have another beef with restructuring. They argue that ISO-NE's marginal-price-based bulk power markets cause ratepayers to overpay for electricity. They say that paying all generators the price that "clears the market" and matches up supply with demand gouges consumers and sends excess profits to lower-cost energy producers. There may be something to this concern, but the challenge is to find a solution that can correct the problem without introducing even greater inefficiencies. Under marginal pricing, the market price for everyone is set by the last unit of a good that's needed and supplied in the market. All suppliers (power generators) are able to sell their output at that last or marginal price. If the cost of supplying the last unit is roughly the same as the cost of supplying all other units, this isn't a big deal. However, if the marginal cost of production (the cost to make each additional unit of output) is sharply increasing, producers who have lower costs get excess profit because they get to sell their inexpensively produced output at the market price set by the last unit produced. In electricity generation, low-cost coal based producers can get a bonus because the marginal price of electricity is usually set by more expensive natural gas generators. Under a regulated monopoly model, utilities could only recover their actual cost of generating the power needed, plus a fixed profit. Although these inefficiencies can be real, in a free market system, most prices are set using marginal pricing. Marginal pricing is how the market figures out the price of a gallon of gasoline, the price of a home, and the price of a new TV. Sure, there are other approaches, but in reality, once you decide that a market-based pricing scheme isn't good enough, you're on the hook to out-design the market and that's usually tough to do. Reverting to the regulated monopoly cost-plus approach has its own inefficiencies. The question boils down to which "synthetic" market structure can achieve the best result. Generating capacity - do you come from a land of plenty? One important step in assuring that the cost of electricity is reasonable is to assure that there's enough generating capacity. Under perfect, free-market competition, there would be hundreds of firms entering and exiting the power generating market and the supply of generating capacity would naturally meet up with the demand. Unfortunately that didn't happen with power generation in the early days of restructuring, and some regions experienced serious electricity shortages as demand grew faster than supply. Since the market didn't naturally build the needed capacity, regulators tweaked things by creating a system of "capacity payments" to encourage power generators to build and maintain enough capacity to serve the market's needs. That sounds reasonable, but as with much of restructuring, getting the incentives right has been tough. In practice, capacity payments aren't just paid to owners that build new plants, they're also paid to existing power plant owners. Many economists believe this is inefficient and raises prices more than is needed to assure adaquate capacity. While it's vital for restructuring that regulators get the market mechanisms and incentives right, the more I learn, the more I become convinced that a huge part of the equation is understanding how risk is allocated, and how we'd like it to be allocated. Exactly how should the risks of a new coal scrubber, wind plant, or nuclear power plant be allocated? Who should pay if things don't turn out as planned? Who should profit if things go better than planned? Advocates of the regulated monopoly approach suggest that because regulated utilities have a lower cost of capital, they can offer a less expensive model for power generation. IMO, this view is incorrect. Unlike merchant power generators, utility power plant owners are basically risk pass-through entities. They have lower financing costs because the risk of their capital projects is passed on to ratepayers. Sure, there are some benefits from the certainty of a captive consumer base, but most of those benefits can also be enjoyed by merchant generators using power purchase agreements to pre-sell their output. In the end, there's really no free-lunch in terms of cost-of-capital. The power plants that regulated utilities build are every bit as risky as those that merchant generators build. It's just a question of how the risk is allocated and who pays if things go bad. It seems that trying to figure out if one regulatory scheme is better than another without delving into the risk model is like trying to decide if bonds are better than stocks by looking only at last month's returns. Unless you've uncovered what the risks are and who's on the hook for them, the pricing at any instant could be a mirage. So, did restructuring cause higher electricity prices in New England? Personally, I don't think so. There have certainly been challenges in getting the market structure right, and these could have increased costs some. Still, I don't see any obvious signs of market failure either. To me the key in all this is to get the incentives and the risk sharing right. Developing a robust electricity generation and delivery system that can meet our needs today and in the future involves taking risks. The ultimate question is this: How much risk do we, as electricity consumers want to transfer onto investors and how much are we willing to shoulder by ourselves? IMO, a purposeful allocation of risks and rewards should drive electricity market structure and getting that right will lead to the best outcome for consumers and for our economy. I came across a recent report by SeacoastOnline about a company in Portsmouth called Powerspan that's doing some pretty cool work with carbon capture technology. Apparently, the firm just completed a pilot program on a 1 megawatt coal plant in Ohio that helped prove out their technology and lay the groundwork for a future commercial deployment. Carbon capture is a technique that helps clean up the output from coal-fired power plants. 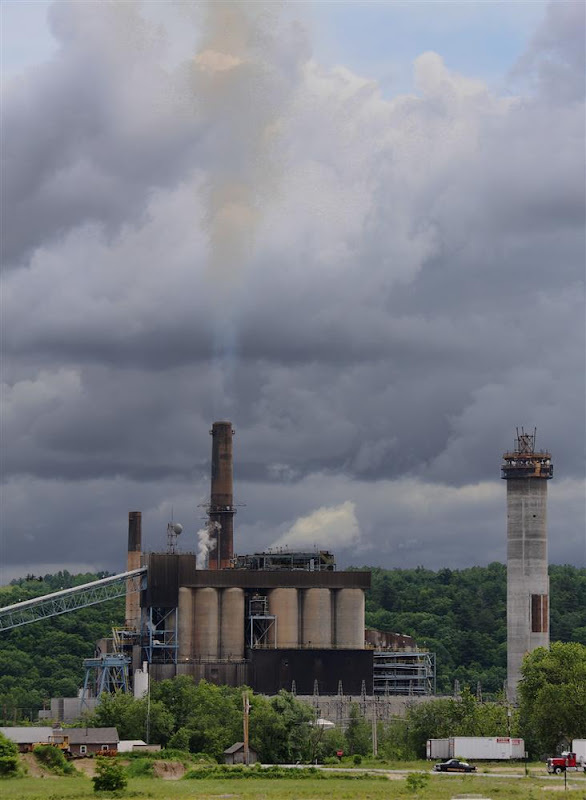 In NH, PSNH is working on cleaning up emissions from our largest coal plant, Merrimack Station, but this effort will only remove mercury and sulfur dioxide, not carbon. As I've mentioned before, for lots of reasons, coal is likely to be an important part of our energy mix for decades to come. Anything we can do to economically clean up the output from coal power plants is a good thing. It's neat that we've got a company right here in the seacoast of New Hampshire that's helping to solve this tough worldwide problem. Although this is promising technology, Powerspan still has some big work ahead of them, especially in terms of economics. The firm's press release on the pilot indicates that using their technology will cost around $50 per ton of carbon removed from a coal plant's output. While this is apparently a breakthrough compared to competing carbon capture technologies, $50 per ton is still nothing to sneeze at. For some perspective on that cost, consider the data in my power generation economics post from last July. In one of the later graphs, I priced carbon emissions at $20 per ton to show the impact of emissions on the economics of coal generation (see graph above). Generating a megawatt hour of power using coal can easily produce a ton of carbon emissions, so adding in a $50 per ton charge instead of $20 would significantly increase the cost of power from coal. 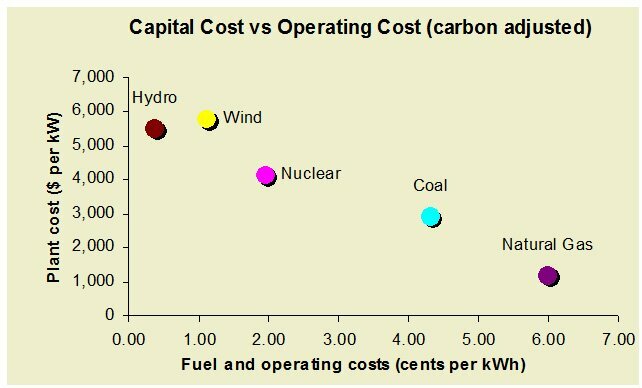 In fact, adding $50 a ton for carbon capture would move coal's fuel and operating cost from 4.5 cents to 7.5 cents per kWh in the graph above. That could make coal uncompetitive versus other approaches. Still, we shouldn't be too negative about the costs of carbon capture. The technology is still in its infancy and we're likely to see major breakthroughs along the way. Also, as long as we're subsidizing other emerging clean power generation technologies like wind and solar, it seems only right that carbon capture is included in the mix. IMO, we should think of investing in power generation technology the way we think about personal investing. We should take a "portfolio" approach and diversify in order to minimize our risks and maximize opportunity. Even though wind and solar are showing great promise right now, we shouldn't put all our research eggs in one basket. It's going to be a long haul to get to a cleaner energy future and I don't think anyone really knows what that future will look like. Personally, I'm glad to see these local folks working hard and smart to help us find the best way there. Fallout from the credit crisis and financial meltdown of 2007-2008 is still all around us these days. Even with improving conditions, you can hardly read a newspaper or watch the news on TV without some mention of the crisis and its impact. Although many people and businesses have been financially impacted, physical signs of the crisis are just now starting to show up on our local landscape. I was in Portsmouth the other day and I did a quick photo shoot of some of the development projects underway. I had done a similar tour earlier in the year and while some of the projects seem to be going along strong, others have been delayed or scaled back. Causation can be hard to pinpoint, but it's probably a safe bet that many of the delays in these projects are due to financing issues or concerns about the economy. In downtown Portsmouth, the Portwalk project is still moving along, although the developer split the project into three phases and is only working on phase I currently. 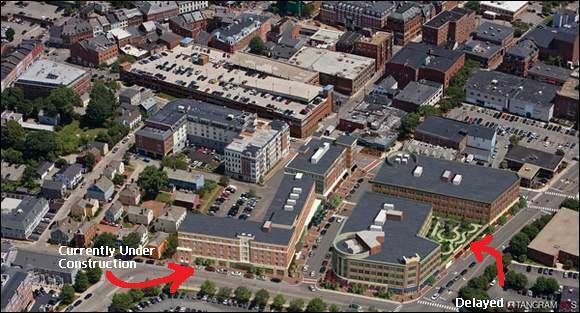 Phase I includes a 128 room Residence Inn by Marriott and 12,000 sq feet of retail space. Phases II and III include condos (or maybe apartments), more office and commercial space, and a parking garage but seems to be on hold indefinitely at this point. 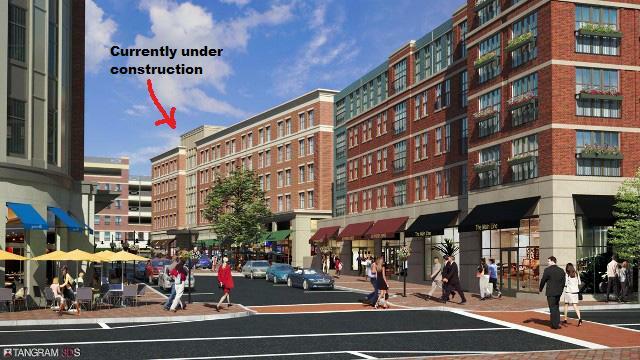 A Westin Hotel has also been approved across the street from the Portwalk project. The Westin project appeared ready to go, and the hotel was even listed on the Westin's website. However, there are no signs of construction and the hotel listing on the Westin website has been removed. There's no official word on the status of the project at this point. Also downtown, the Martingale Wharf project is just now coming out of a 9 month long stall. Work has recently started again on this 50,000 sq ft retail, commercial, and residential condo project on Bow Street after months of sitting idle. On the positive side, the project at the old Pier One Restaurant site (soon to be residential condos) appears to be moving along despite the tough economic conditions, as shown in the photo below. Finally, the City of Portsmouth project to relocate the waterfront deck at Poco's Restaurant and rehabilitate the public right-of-way seems to be coming along. With the construction of a new building at Martingale's Wharf, this area now offers the only riverfront view on this section of Bow Street. Residential Sprinklers - What's a life worth these days? ... The cost-per-life-saved for residential sprinkler systems is estimated at between $2-$36 million (in US dollars) according to reports from New Zealand and Canada. According to a recent WMUR-TV report, the New Hampshire State Building Code Review Board has voted to require sprinkler systems in new residential construction starting in 2012. Most fire safety officials laud the use of sprinkler systems for their ability to save lives, reduce injuries to building occupants and firefighters, and reduce the costs of fire damage. There's not much debate about whether sprinkler systems save lives and reduce property damage. They do. The debate comes in when officials try to figure out if the savings are enough to offset the estimated $1.00 to $1.50 per square foot that sprinklers will add to the cost of constructing a new home. With the average square footage of new construction in New England running at around 2200 square feet, sprinklers could easily mean a $2500 to $3000 increase in cost. That's where the analysis starts to get interesting and the squeamish head for the exits. Just how much is a life worth anyway? People say you can't put a value on a human life, but I say heck, engineers and safety officials have to do it all the time. Vehicle designers, transportation system planners, and of course, medical professionals are all too familiar with this gruesome mortality math. To start, I found this encouraging table from the US Fire Administration that shows that NH has the lowest fire death rate in the country, at 4.6 deaths per year per million. Regardless of where you stand on the sprinkler issue, that's good news. Next, I did some quick googling and the first sources on cost-per-life-saved for residential sprinkler systems that I found were outside the US. (I wonder if this says something about our collective squeamishness here in the US). This report from New Zealand estimates the cost per life saved at around $2-$5 million dollars (I did a currency conversion from the numbers in the report). Another report from Canada put the cost per life at a whopping $36 million. Still another report from the UK puts the number at around $1 to $2 million. Finally, the only US report I could find in my quick google search, from the Pennsylvania builders Association, puts the cost at over $80 million per life saved. Obviously, there's plenty of room for fudging the numbers and some of the groups producing these estimates have a vested interest in inflating the numbers to avoid new regulations, but at least you can get an idea of the order of magnitude. To be fair, advocates of these mandates point out that they not only save lives and reduce injuries, but they also can protect property by reducing the severity of fires. The economics might be a bit tenuous, but I can't really blame the folks that have to run into burning buildings for advocating for more fire-safety equipment. These regulations would almost certainly make the outcomes they witness in their day-to-day jobs a lot less horrific. 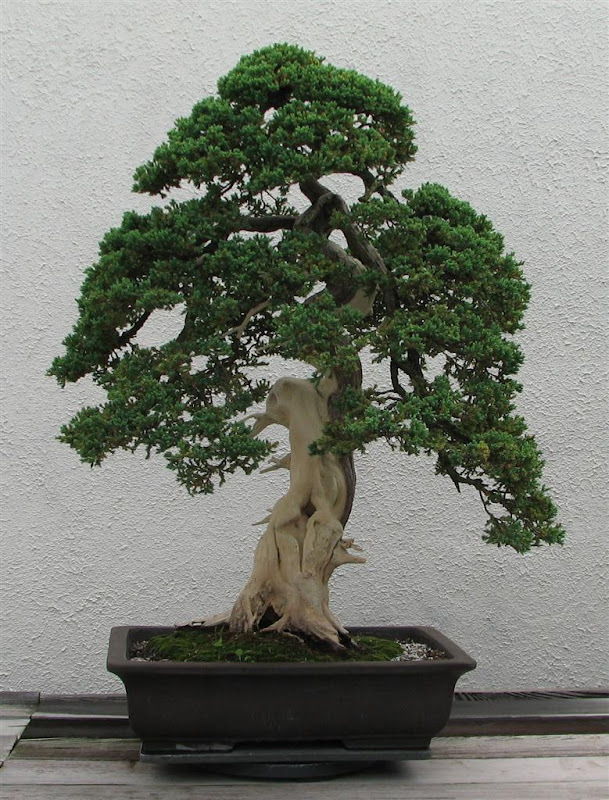 "...the ultimate challenge for the bonsai designer is to expose the essence of the tree. " Beginning in the early 1990s, electricity markets in New Hampshire and across the country have been restructured and reorganized. As with the Bonsai tree pictured above, regulators have worked hard to shape these new markets, trimming, pruning, and pinning up where necessary. The goal is to coax the new electricity markets to take on the shape of capitalism's beloved free markets. In the early days of commercial electric service, electric companies mostly developed into natural monopolies. Although there were exceptions, especially in the early wild-west days of the industry, it was soon recognized that it didn't make sense to string up redundant sets of wires to serve each potential customer. For most of the twentieth century, electricity was provided under the staid and stable regulated monopoly model. Electric utilities were vertically integrated and provided everything from power generation, to transmission, to neighborhood distribution and customer service. Utilities were typically organized as investor owned for-profit firms, or municipal non-profits. Under either model, outcomes were generally stable and predictable for everyone involved. Then in the 1980s, there was a national trend to deregulate and restructure several industries that had historically been heavily regulated. This move was partly fueled by the success of the conservative movement under Ronald Regan, and was later spurred along by the collapse of communism in the Soviet Union and a nearly worldwide change-of-heart on the benefits of free-market capitalism . By the early 1990s, in the US and around the world, several industries, including airlines, telephony, and gas and electric utilities, were deregulated or restructured in hopes of harnessing the forces market competition to the benefit of investors, customers and the economy. The timing of the global sea-change toward free markets couldn't have been worse for regulated electric utilities. By the late 1980s, the industry was suffering from the effects of multiple energy price shocks during the 1970s followed by a nasty nuclear hangover. The cost-plus-guaranteed-return pricing model of regulated electric utilities was a natural fit for nuclear power's high capital cost, low energy cost model. With nuclear power, utilities hoped to leverage their cheap access to debt and lock in the price of electricity for years to come. Nuclear power promised boundless clean electricity that according to its advocates would be "too cheap to meter." If only it had turned out to be so. By the late 1980s, the nuclear "experiment" was floundering in a sea of red ink and ratepayers across the country were fed up. Businesses and industrial users in the Northeast were especially hard hit by high electricity costs and demanded action from their state legislators. Meanwhile, supporters of "deregulation" suggested that the utilities' experiment with nuclear power wasn't the problem per se. It was just that the risk-model was broken and the regulations were excessive . They suggested that with a free-market approach, investors would be free to search out new ways to generate electricity as they saw fit. With enough competition and enough experimentation, free-markets would ferret out the lowest cost solution and everyone would win. As a bonus, it would be hapless investors who would bear the costs of the failures, not ratepayers. The plan to move the electricity industry toward a free market structure started with an analysis of where competition had the best chance of working. Electricity generation seemed like the most obvious place to start. The idea was that if independent power producers were given open and free access to statewide and regional electricity grids, market competition could flourish. To make way for competition in power generation, the market power that utilities enjoyed in both generation and transmission had to be diminished. Different states took different approaches, but New England generally followed the design presented in the Federal Energy Regulatory Commission's (FERC) Order 888, which was issued in 1996. This order, along with subsequent orders, presented a framework where utilities would sell off their generation capability and give up control over the power grid to pave the way for competition. Most reform plans included the creation of a regional transmission organization to manage the power-grid and create a fair and open process for connecting to the grid. The groundwork for restructuring in New Hampshire was kicked-off with the creation of ISO-NE in 1997. Regional system operators were also charged with the task of creating standardized wholesale power markets, where market participants could sell and buy electricity as though it was a commodity. The creation of standardized wholesale power markets paved the way for another market reform. Once power could be traded like a commodity in a "virtual world" running parallel to the wires and transformers, end-customers could choose who to buy their power from. Regulated utilities would still maintain the distribution infrastructure, but customers could choose to buy their power from an independent "power marketer" instead of their local utility. The model was similar to long-distance phone service, where customers could choose a long-distance provider other than their local telephone company. Finally, restructuring would leave legacy utilities as regulated monopolies to maintain local power distribution systems and take care of customer service. In New Hampshire the original idea was for utilities to sell off their generation and transmission resources, however some utilities, most notably PSNH, were permitted to retain some "grandfathered" resources until the end of their useful life. All regulated utilities in New Hampshire are prohibited from building or owning new power plants and new transmission resources. As I've mentioned in previous posts, New Hampshire relies on ISO-NE for both maintaining the power grid and operating regional power markets. I've also posted about the companies in New Hampshire that own and operate power plants as independent power producers. ISO-NE also maintains a connection queue so that power plant owners can get open an fair access to the power grid. So far, so good, but unfortunately, it's not all roses from there. The model for competitive electricity markets here in New Hampshire is complicated and evolving. For lots of reasons, it's been tough to get the structure just right, and some believe that the current "sort of a free-market" system is deeply flawed. Still others are confident that the right mix of regulation and market incentives can and will be found, and the benefits will far outweigh the costs. There's lots to cover with this topic, so the plan is to do a short series of posts on some of the challenges that we're facing with restructuring here in New Hampshire and around the country. 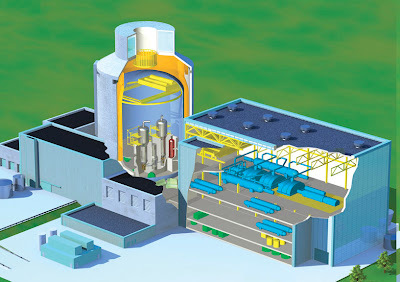 David Brooks at the Nashua Telegraph and GraniteGeek put up a post today on nuclear power and the issues around extending the license on the Vermont Yankee nuclear plant. As Dave pointed out earlier, the Seabrook Station nuclear power plant is also applying for a license extension. Dave says that he's "pro-nuclear, but ready to waffle at a the drop of an isotope." Well, I'll see Dave's waffle-readiness and raise him one. I'm decidedly undecided on nuclear, but ask me again in 5-7 years and I may have an opinion. I suppose my wait-and-see attitude puts me more on the side of the nattering-nabobs-of-negativism for now. There are around 50 nuclear power plants under construction worldwide (~24 in China, none in the US). Included in that mix are three next-generation plant designs that are purported to have much better economics than nuclear designs of years past. As I indicated in an earlier post on Westinghouse Electric in Newington, the three new designs are the AP1000 from Westinghouse, the ESBWR and ABWR from GE-Hitachi, and the EPR from French owned Areva. If these new designs pan out and can 1) keep construction delays to a minimum, 2) stay roughly on budget, and 3) operate reliably for a few years, we'll find ourselves in a new era of nuclear power. If that happens, there could be a seismic shift in our approach to emissions-free base load power generation. OTOH, the capital markets are still loudly saying no-thanks to nuclear power. That's why the nuclear projects underway today are mostly being built by oppressive regimes with excess cash (China can only buy so many US treasuries), and by state-run or regulated monopolies that are able to push nuclear power's project risk onto ratepayers. By anyone's math, getting nuclear power to be economical is a tough nut to crack. The cost-of-capital problem for nuclear is insurmountable without ratepayer guarantees, government financing, or a big change in market sentiment. To make matters worse, recently there's been some bad news on the next-gen design front (see here and here). IMO, it's too early to tell how serious these design issues are and I still have an open mind on the future. But, it's going to take a while to see how this movie ends. As far as the old plants go, I'm for milking them for all we safely can. Seabrook just finished refueling this month and is back online and good to go for another 18 months. The emergency sirens were tested last Wednesday and since I'm in the evacuation zone, I was able to hear them loud and clear. Perhaps I'll be proven wrong, but with nuclear power, I'm less worried about safety and much more worried about economics. Sure, the safety and disposal challenges are real, but IMO, the economic issues are bigger. Many people claim Seabrook is providing us with loads of economical electricity. Unfortunately, that's only true if you ignore the PSNH bankruptcy, the huge losses by investors and ratepayers, and the fire-sale of the plant to FPL/NextEra. Granted, some of the delays at Seabrook were due to regulatory/licensing issues, but that wasn't the whole story. In the end, with Seabrook we made the ultimate investing mistake of buying high and selling low. I suspect FPL did fine with their investment in Seabrook, but for the rest of us, not so much. As for this new generation of nuclear power plants - only time will tell. So ask me again in 5-7 years and I may have an opinion. Thanks to generous federal and state incentives, solar PV electric systems are currently ON SALE in NH for almost 50% off! New Hampshire resident Heather Parker included solar photovoltaic (PV) electric modules as part of her ambitious project to construct a super-efficient solar home in Portsmouth, NH. This new home lives and breathes energy efficiency, right down to its bones. The house sports a passive solar design, super-insulating materials throughout, and a solar-thermal hot water heating system. Each of these systems is interesting on its own, and you can read more details here and here. But for this post, I'd like to focus on the home's solar photovoltaic electric system. The photo above shows the array of 16 SunPower 210 watt PV modules, mounted on the right-hand side of the home's roof. The 3.4 kW solar electric system was designed and installed by ReVision Energy, of Liberty, Maine. Because Heather's home is so efficient, this 3.4 kW system should provide a large portion of the home's annual electricity needs. In the photo above you can see the SunPower 3000m inverter, which was mounted on an outside wall to conserve indoor living space. In addition to the inverter, ReVision Energy also installed a separate solar meter between the inverter and the home's main circuit panel. Just underneath the solar meter is PSNH's electric meter. This appears to be an Itron model C1S solid-state watt meter. According to Itron's website, these meters can be equipped with optional "personality modules" to provide advanced features such as time-of-use (TOU) metering, load profiling, and RF-transmission. The cost of photovoltaic (PV) solar modules has dropped rapidly recently and the efficiency of PV systems is ever increasing. You'd think that generating clean electricity from the sun would be an economic no-brainer. Well, as usual, it's not so simple. According to the SolarBuzz.com retail price summary, PV modules currently retail for around $4.34 per watt in the US. An inverter to convert the system's DC output into AC that can be tied to the power grid runs another $.71 per watt. Add in the cost of other supplies and installation and the total cost for a complete solar electric system can easily range between $6 and $10 per watt. A new PV solar electric system, sized at 5kW-7kW to cover a good portion of a typical NH home's electricity usage of 7,000 kWh per year, could easily cost upwards of $50k. That's a serious investment! Of course, the easiest place to start reducing costs is with lower consumption, which Heather's house shows is possible. Thanks to its super energy-efficient design, it uses about half the power that a conventional house uses each year. OK you say, the upfront cost for a new solar electric system may be high, but it's a one-time charge and in exchange you get clean and free energy for years to come. Also, in New Hampshire there's a $3 per watt rebate from the RGGI renewable energy fund, administered by the state of NH and the NH Public Utilities Commission (up to $6k max). In addition, residential installations can qualify for a federal tax credit worth 30% of the installed cost of the system. With all these great incentives, it's should be much easier for PV solar electric systems to be economical, even here in New Hampshire. Running the numbers - Can a PV project make economic sense? To find out how economical a new solar electric system might be, we need some data. We need to determine how much electricity the system will generate. A system that's rated at 5 kW, can only produce that peak output with perfect conditions. As with other electricity generation approaches, we need to know the system's "capacity factor" or it's annual production rate. Also, solar panels produce DC current that must be converted to AC for home and electrical grid use. This conversion, along with other system losses, reduces efficiency. We need to somehow find a way to take all this into account and extrapolate from raw system capacity into a realistic estimate of actual kWh production. Then we need to somehow convert that production into dollars so we can perform a discounted cash flow analysis to see if it's all worth it. As I said before, Portsmouth solar home owner Heather Parker was generous enough to share the details of her solar electric project, so we can use this "real world" data in our analysis. The image above is a composite of four photos that shows the alternating output from Heather's DC to AC inverter. I took these shots late in the afternoon near sunset, so the array was only producing 527 watts at the time. In the mid-afternoon, the array produces as much as 2,700 watts. Another inverter display shows that the system produced a total of over 9 kWh of electricity on the chilly November day I visited. You can also see that since the system was installed a couple of months ago, it has produced a total of 735 kWh of electricity. Finally, the home's reduced intake of electricity from PSNH has already lowered carbon emissions from local power plants by an estimated 1,250 pounds. Lots of good stuff in the PVCalc output, that's for sure. You really can see that the tax credits and rebates are an important part of the equation. In Heather's case, the credits covered almost 50% of the system's installed cost. For fun, I manually calculated a break-even kWh price for the project. It worked out to 22.1 cents per kWh without the tax credit and rebate factored in and 11.5 cents per kWh after subtracting them out. The PVCalc tool also does some sophisticated capital project analysis. In particular, the tool performs a discounted cash flow (DCF) analysis to compute an internal rate of return (IRR) and net present value (NPV) for the project (these are shown on the amortization tab). You may recall that I mentioned DCF when we did our analysis of commercial wind projects in NH. When analyzing capital projects, even home solar electric projects, DCF is the gold standard because it factors in the idea that a dollar received today is worth a lot more than a dollar received in 30 years. To compute a net present value, the project's future cash flows are "discounted" or adjusted to "today's value" dollars. Next, these "present values" are added together and the initial project cost is subtracted from the sum or netted out. If the resulting NPV is positive, the project will yield net savings (because the present value of future cash flows is greater than the project's cost). If NPV is negative, the project is not likely to be economical. Also, the higher the NPV, the better. NPV is computed using a "discount rate" that takes into account the project's riskiness. Since home energy efficiency projects are pretty low risk, a discount rate of 5% (which is the PVCalc default) seems appropriate. It might even be little on the conservative side, but better safe than sorry. Running the Numbers - What if things don't go as planned? Below I made a table that shows what happens to the PVCalc outputs when some of the key input parameters are changed. This "sensitivity analysis" helps identify how dependent the project's success is on the accuracy of the inputs. Since it's impossible to predict the future with certainty, sensitivity analysis is helpful to show whether a project will still be economical if things don't turn out exactly as planned. Right away, you can see that success for Heather's project is highly dependent on how fast PSNH's electricity rates increase over the life of the project. The tool's default assumption is a 5% annual increase in rates. The table above shows that with a more modest 3% annual increase, the NPV of the project declines significantly. That's no surprise, since the value of the electricity produced by Heather's solar array is directly related to PSNH's electricity rates. Still, even with a very modest 3% annual increase in rates (we wish! ), the project still has a positive NPV, which means it will be economical even in that unlikely circumstance. On the flip side, should electricity rates increase by 7% a year, the project's NPV would increase to nearly $9k, more than double the NPV of the baseline scenario. A 7% rate of increase in electricity prices may sound high, but when you consider expected inflation rates, the long-term outlook for fossil fuel prices, and pending carbon-pricing initiatives, 7% doesn't seem far-fetched at all. You can also see from the table above that the system's derate factor has a huge impact on the project's economics. The derate factor represents the overall efficiency of the system. The solar array's raw DC output is multiplied by the derate factor to determine net electricity production, so the higher the derate factor the better. With a 69% derate factor, instead of the 77% default, the NPV practically drops in half. Conversely, with an 85% derate factor, the NPV increases by nearly 50%. This shows that the PV array's nameplate rating is only part of the story. The efficiency of the whole system has to be considered. As an example, according to this NREL derate calculator, increasing inverter efficiency by just 3% and keeping the panels from getting soiled could increase a system's derate factor from 77% to over 83%. Next, I varied the azimuth angle to see what that would do. When Heather was deciding how to position the house on the lot, she had a dilemma. By positioning the house so the roof faced south east instead of due south, she got a much nicer view. However, Heather knew that facing the solar array at 155 degrees instead of due south at 180 degrees would reduce her available solar energy. Using PVCalc, we can see that this decision only dropped the NPV by $500 and still left her with plenty of net savings. Considering the nicer view, it seems like a smart tradeoff. I also experimented with a 40 degree roof pitch to simulate what mounting the array on a 10/12 roof would do, compared to using Heather's 12/12 pitch roof (45 degrees). That change actually resulted in a slight improvement in the NPV. Finally, I experimented with some financing options to see how they might affect the project's NPV. I assumed cash payment for all my earlier scenarios, but I wanted to see how using a home equity loan would impact the results. Since a home equity loan is usually tax deductible, part of the interest paid on the loan is "refunded" and that will defray the project's costs. You can see that with a 5% home loan, the NPV of the project increases from $3,719 to $4,971. That increase in NPV is largely the result of the tax break on the financing, as shown on the last page of this pdf report. To do a complete cash vs. finance analysis, you'd need to also factor in the after-tax return you expect to receive by investing the cash instead of using it to pay for the project. Solar Electric Systems - What's the bottom line? As you can see, varying these input parameters causes the NPV to bounce around all over the place. This is why sensitivity analysis is so important. It let's you evaluate a project under a range possible of outcomes. Based on this analysis, it's a pretty good bet that the project's NPV will fall somewhere between $0 and $9000, and any of these outcomes would be great for Heather. Our sensitivity analysis has shown that in the face of many uncertainties, the project's economics are quite robust. So after lots of number crunching, it looks like Heather's solar electricity project is a winner, both for the environment and for her pocketbook. Even if some of her assumptions about the system's efficiency or PSNH's future electric rates turn out the be wrong, it's very likely that this project will still be a great investment. Plus, no matter how you slice it, dumping 2 tons less of carbon into the air every year can't be a bad thing! Yesterday, our washing machine died after a relatively short life of only six and a half years. It's one of those newfangled front-loading machines. These new machines can really get clothes clean and they're great from an energy efficiency standpoint, but IMO they're much less reliable than the old-fashioned top-loaders of yesteryear. Our last top-loader gave us around 15 years without a service call before it died. Granted, my sample-size is small, but I'm beginning to wonder if the higher capital costs and replacement costs of these new designs negate all the efficiency savings benefits. Replacing your washer twice as often is expensive and can't be very environmentally friendly. Anyhow, despite the fact that our old washer was energy efficient, I thought we might be able to benefit from the appliance rebate program that was part Recovery and Reinvestment Act of 2009 (stimulus bill). Some have called the program cash-for-appliance-clunkers. Unlike the auto cash-for-clunkers program, the appliance rebate program is administered by the states. Each state is allocated funds for the program ($1.2 million for NH) and submits an implementation plan to the US Dept. of Energy for approval. Now the bad news - well for me anyway. New Hampshire decided to buck the national trend and try to be a bit innovative in their implementation of the appliance clunkers program. Instead of offering rebates for air conditioners, refrigerators, washing machines, and other appliances, New Hampshire's Office of Energy and Planning decided to target the rebates at home heating equipment and hot water heating systems (including solar-thermal). Their official press release notes that there's already a state rebate program for energy efficient appliances, so targeting these new rebates toward heating and hot-water applications will give New Hampshire a bigger bang for the buck, energy efficiency-wise. On its face, the plan seems to make sense and it's always good to see New Hampshire leading rather than following the herd in terms of innovative state programs. I'll try not to be bitter that Uncle Sam won't be helping to buy us a new washing machine. It's 9:00 am, do you know what the bulk price is for electricity in New Hampshire? A competitive electricity market depends on the the ability of producers and consumers of electricity to transact business in an environment that's organized, transparent, and free from manipulation. The producers of bulk electricity are power plant owners while the consumers include regulated utilities, large businesses, and power marketers. Power marketers are companies that resell energy to customers as their their "energy supplier." Currently in New Hampshire, residential customers must purchase energy from their utility because no power marketers have chosen to serve residential customers. Businesses in New Hampshire can choose from among a dozen or so energy suppliers. In New England, the bulk electricity market is operated by ISO-NE. You can think of ISO-NE as running something like a stock exchange, where buyers place bids for the power they need and generators place offers for power they're willing to supply. 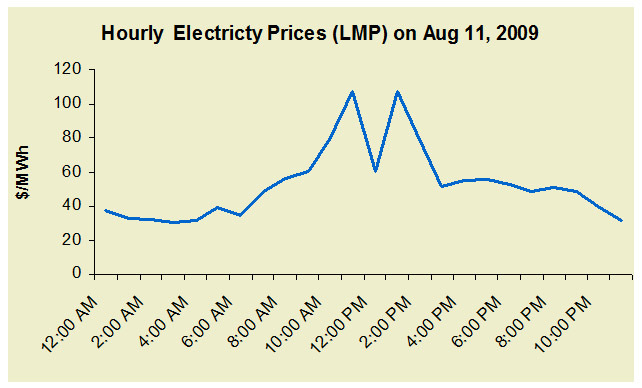 The photo above is a screenshot from ISO-NE's website that shows the real-time location-based marginal prices (LMP) for bulk electricity at 9am yesterday. The differences in prices between the states are due to transmission line losses from power having to travel greater distances and from congestion surcharges resulting from power having to travel over congested transmission lines. In reality, the bulk power market system is much more complex than this map shows. It contains over 900 distinct pricing "nodes" (pg 12) that include every generation station and many aggregation points for bulk load. In addition, there are several pricing nodes at key transmission system interconnects. The graph only shows representative data from key nodes throughout the system. The prices shown in the map above are for a megawatt hour (MWh) of electricity. One MWh is 1000 kilowatt hours (kWh), so a price of $39.10 per MWh comes out to about 3.9 cents per kWh. That's the bulk price at a relatively low-demand period. For comparison, the retail energy charge for PSNH residential customers is around 9 cents per kWh. PSNH's regulated 9 cent rate is much higher than the 3.9 cent rate because it's an average rate and it takes into account peak demand periods where the bulk rate can jump to over $150 per MWh (15 cents/ kWh). PSNH's retail rate also includes a wholesale to retail markup. You can see why many are calling for time-of-day metering to more closely tie the price people pay for electricity to the actual cost of electricity. If using electricity in the afternoon cost 3 times as much as using it overnight, would you change your behavior? ISO-NE's bulk power market is only virtually connected to physical electricity production and consumption. This connection is accomplished through a web of regulations and contract settlement procedures. A purchase on the bulk market doesn't suddenly start the flow of electricity to the buyer nor does a sale mean that a generator must start their turbines spinning. These bulk markets are a parallel financial universe that mirrors the physical world and provides a means for market participants to "settle up" for the power they produce or consume. Generally, power plant owners and bulk electricity "loads" have three options at their disposal for exchanging virtual "rights" to electricity. The first two options are operated by ISO-NE and include the real-time market described above as well as a day-ahead market. The day-ahead market can be used by utilities and other loads to cover part of their estimated demand for the next day with pre-purchased electricity. This gives participants protection from minute-to-minute market volatility and provides important price stability to both generators and loads. The third way for generators and loads to pre-negotiate prices for electricity is through bilateral contracts. A bilateral contract is a contract between a generator and a load to supply a specified amount of power at a pre-negotiated price during a pre-negotiated period. These contracts can be for power supplied the next day, or they can be for power to be supplied over a period of years. They're an important component of competitive electricity markets because they provide long-term stability and predictability in an otherwise highly volatile market. Bi-lateral contracts are essential for plant owners to secure long-term financing and they also allow utilities and large businesses to control their exposure to unexpected spikes in the price of electricity. Finally, in addition to managing the market for bulk electricity, ISO-NE also manages several other electricity related markets and auction processes. The goal is to create what I'd call "virtual electricity products" which include things like financial transmission rights, forward capacity payments, ancillary services (eg providing spinning reserves), and renewable energy credits. ISO-NE, under the guidance of the Federal Energy Regulatory Commission (FERC), attempts to harness market forces to manage both the supply and demand of things like transmission line capacity, generation capacity, backup reserve capability, and renewable electricity generation. These artificial markets are very complex and regulators are continuously tweaking them to make them operate more effectively. That's a good thing, because badly functioning electricity markets can really make a mess of a state's economy, as California found out a few years back. When I visited Concord, NH a few weeks ago to attend the tax summit, I got a chance to visit our state capital for the first time. Living in the seacoast, I don't make the trip over to Concord very often. I've been to the LL Bean Outlet, Company C, and even a few of the shops on Main Street. But I'd never been inside the State House. The tax summit was actually held in the Legislative Office Building, but since there were several breaks over the course of the two day summit, I had plenty of time to wander around to the other government buildings. Once I got past the State House entrance hall (called the Hall of Flags), walking through the interior hallways and past the offices of the grand old building reminded me of the classrooms at my old college. The NH State House was originally built in 1819 and apparently is the oldest state house in the country that still houses the legislature in their original chambers. The Senate Chamber (above) is located in the northeast corner of the State House on the second floor. After checking out the normal visitor photo spots throughout the State House, I ventured into some areas that are probably less traveled by visitors. In particular, I headed down into the basement to the cafeteria. Since I had some time before the next summit meeting session, I decided to hang out in the cafeteria and take advantage of the free public wifi provided throughout the State House. The food in the cafeteria was reasonably priced, and I could enjoy it while catching up on my email and the news of the day. The cafeteria is a bit on the austere side as you can see from the photo above. There were no fancy sinks or marble countertops here. Still, it proved to be a great spot to rest and re-group before heading to the afternoon tax summit sessions. As an added bonus, I saw a few well-known elected officials taking their lunch breaks. I wonder if any other state governments offer their citizens the opportunity to share a brown-bag lunch with their legislators in a basement cafeteria? "Secret" underground passageway between the State House and the Legislative Office Bld. Wandering around out of the cafeteria, I discovered a "secret" underground passageway that leads back to the Legislative Office Building (LOB). It was great to be able to stealthily move between the State House and the LOB without having to face the protesting mob above - ok, there were only 20 or so tax-protesters and they seemed pretty well behaved. I think there's another tunnel to the annex building that's across Capital Street, but I didn't check that one out. Once through the tunnel, I arrived in the basement of the Legislative Office Building, which was built in around 1875 as a post office. At one time, the building was used to house the US District Court. Today, it provides meeting space and offices for several legislative committees. Overall, I found the NH State House and associated buildings very approachable for visitors. I double-checked to make sure I could take photos and then wandered around freely looking for good shots. At one point, a NH State Trooper approached me to ask if I needed directions. It was right after I finished taking the tunnel photos and I'm pretty sure I may have been caught on video looking suspicious (I mounted my camera on a monopod to get the shot without a flash). Anyhow, the officer was very friendly and when I explained that I was taking pictures for my blog, he wished me luck and headed on his way. So if you haven't visited "your" state capital yet, I highly recommend it. When you go, be sure to check out the secret tunnels and the free wifi in the basement cafeteria.